Filed to: this is it?Filed to: this is it? Remember that mystery product Benjamin Heckendorn was creating with eDimensional? Turns out it's a 5.1 gaming headset. 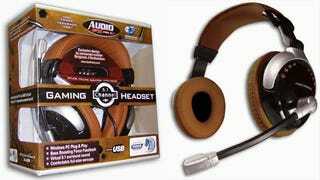 The gadget, an AudioFX Pro 5+1 gaming headset, is a USB headset with a mic that has an integrated subwoofer and integrated 5.1 surround sound decoder. There's force feedback in there as well if you really like your head to vibrate. We're looking forward to seeing this product, because if Ben Heckendorn's track record of making controllers, handhelds, and Xbox 360 laptops shows one thing, it's that he knows audio.